If you watch The Walking Dead then you know exactly who Norman Reedus is. If you don't watch the zombie thriller that airs on the AMC channel but like motorcycles, then start tuning in. Ride with Norman Reedus , a six-episode reality show starring Reedus, debuts sometime in 2016 on AMC that features the actor traveling the country and exploring motorcycle culture. 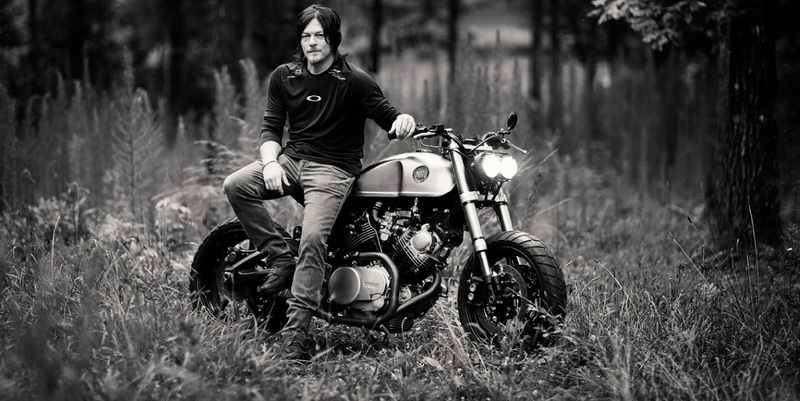 Reedus, who rides a motorcycle in real life and on the hit show, used to work at a Harley Davidson shop. On The Walking Dead Reedus rides a custom built bike based off a 1992 Honda CB750 Nighthawk with Yamaha R6 suspension and other heavy modifications. Check out the entire specs here. In real-life he mounts a custom XV920R - both bikes were built by Classified Moto. Each episode of Ride with Norman Reedus is an hour long and "takes viewers on a ride on the open road to explore local motorcycle culture and its history and celebrate some of the best and brightest collectors, mechanics and motorcycle craftsmen around the country." "I'm incredibly excited and thankful to AMC for giving me the opportunity to share a passion of mine with our fans, and hopefully a whole new audience. I had a lot of fun filming and exploring, and I hope it shows," Reedus said. The new series helps fill in the void left by the popular American Chopper featuring the Teutul family who manufactured custom chopper motorcycles. That show set in Orange County, NY started on the Discovery Channel in 2003 got picked up by the TLC channel in 2008 and ran through 2010 with a couple of one-off shows since then. Reedus joins an already growing chorus of motorcycle riders in the entertainment industry including Jay Leno who has served as Grand Marshall of the annual Love Ride that raises money for veterans. The Love Ride ended its historic run as the largest and longest-running one day motorcycle charitable fundraising event in the world after 32 years earlier this month and raised more than $1 million for the Wounded Warrior Project. Foo Fighters and Social Distortion headlined the festivities held on October 20 at Castaic Lake, CA. Last year, Keanu Reeves started Arch Motorcycle Co. that manufactures the hand-built KRGT-1 hand-built motorcycle designed by Reeves and his partner Gard Hollinger. Other notable actors and actresses who ride motorcycles include Peter Fonda, Robert Patrick, Lorenzo Lamas, Kristy Swanson, Arnold Schwarzenegger, Catherine Bell, Brad Pitt and Angelina Jolie.